Last year I purchased a Philips Air Fryer and since then I’ve enjoyed creating recipes specifically for the air fryer. 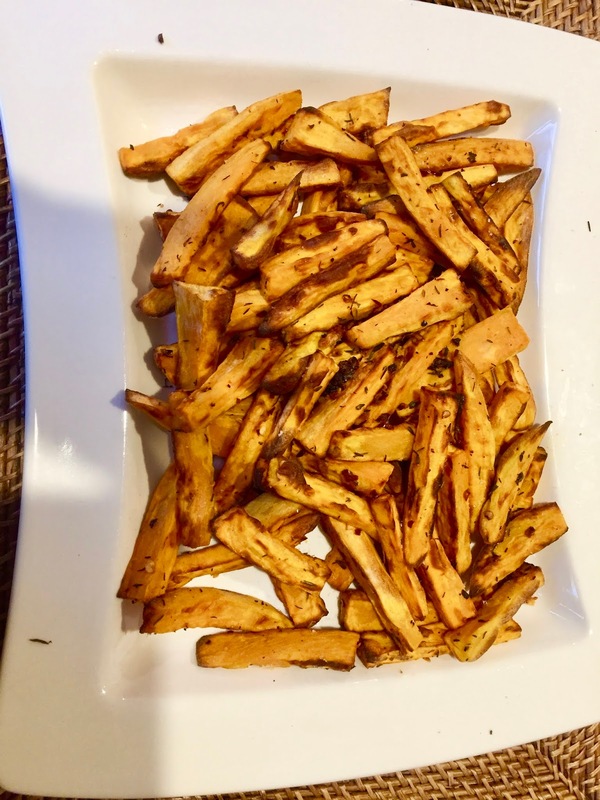 I love sweet potato fries and adapted a recipe for the air fryer. These sweet potato fries are healthy, spicy and tasty. Easy to make without messy clean up. I can make these quickly on a weeknight for a delicious vegetable to complement any meal. Preheat air fryer to 400°F 8 minutes. Lightly spray the fryer basket with oil. Slice each potato into even 1/4 inch thick fries. Toss with oil, salt, garlic, paprika and red pepper. Cook in 3 or 4 batches, without overcrowding the pan 8 minutes, turning half way. Place on serving plate and top with pink Himalayan sea salt. At a local restaurant I ordered my first spicy edamame as an appetizer and I was hooked on spicy edamame. 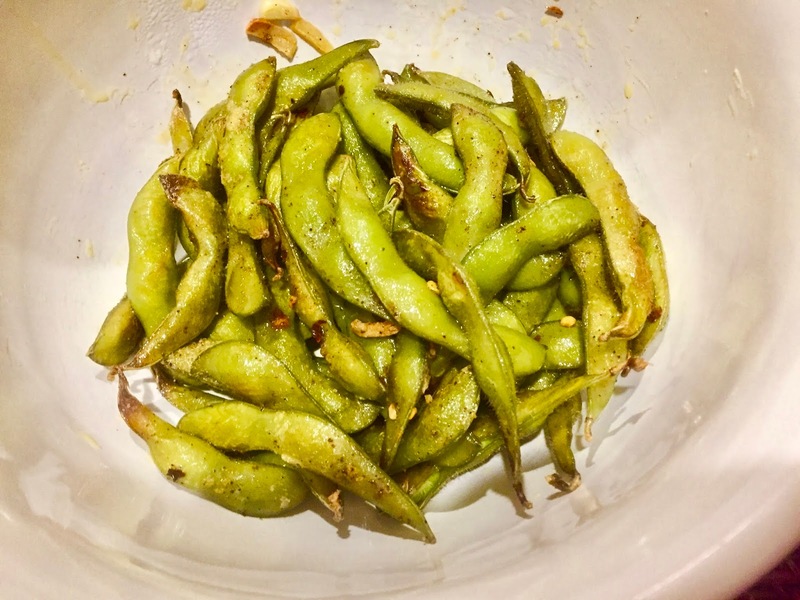 I use frozen edamame, season and roast. Easy, delicious, I think even better than the restaurant version! 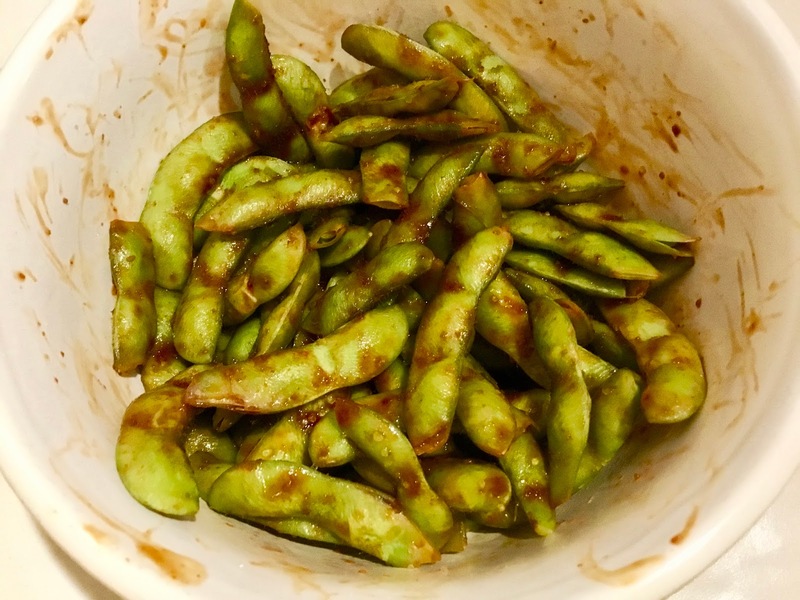 Preheat oven to 375 F. Place edamame in large bowel. In a small bowel combine oil, sliced garlic, salt, chili powder, pepper flakes and dried oregano. Pour oil mixture over edamame. 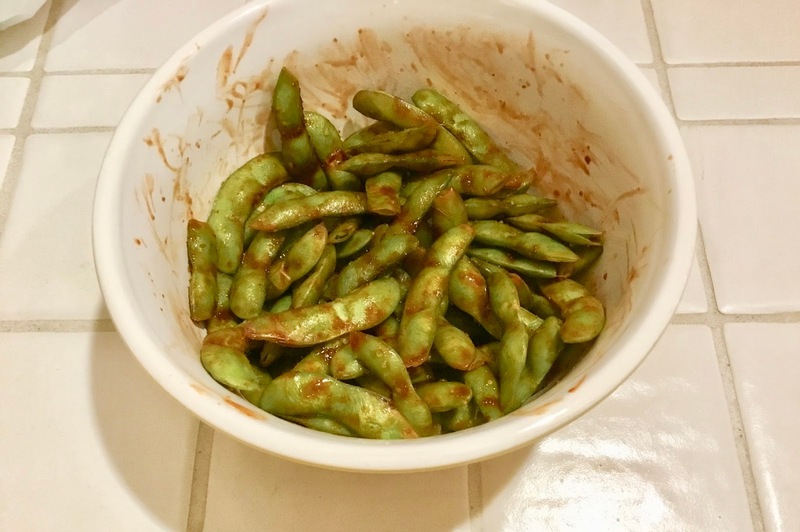 Bake edamame in oven for 12 to 15 minutes until pods begin to brown. Stir once halfway through cooking. Serve warm. Roasting vegetables enhances the flavor without losing the nutritional benefits. Cauliflower, basically bland, is the chameleon of the vegetable world assuming the flavor and taste of spices pared with during cooking. A perfect companion for creating an array of interesting vegetable dishes. 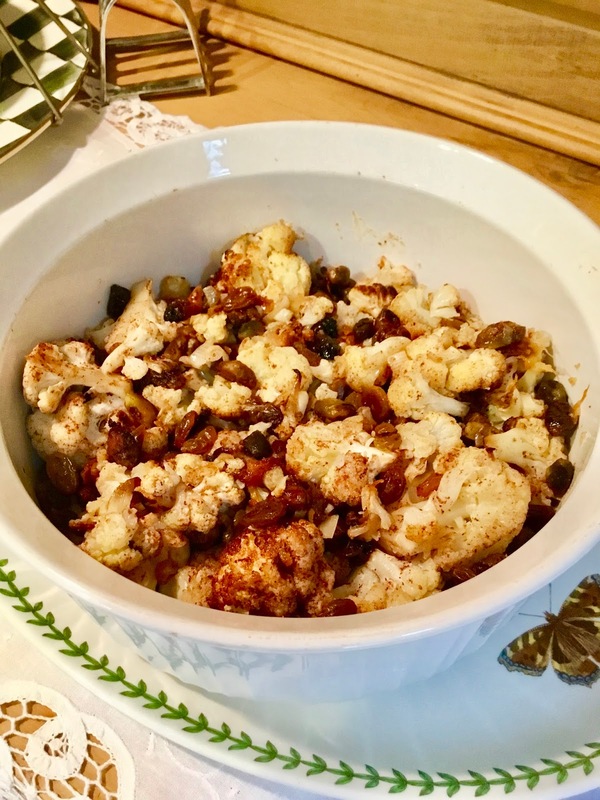 Adding a Moroccan melody of spices to cauliflower with a touch of honey and pistachios the cauliflower is transformed into an exotic side dish bursting with flavor. Preheat the oven to 450 degrees F. Toss cauliflower with ingredients and place in a baking dish. Roast for 20 minutes until tender and golden. Brussels Sprouts that neglected and shy little bulbs have become trendy – the darling of the vegetable world. Healthy, tasty, versatile, a chameleon, changing depending the pairing – never boring or the same. Steamed, baked, roasted, raw in a salad your choices of preparation are endless. 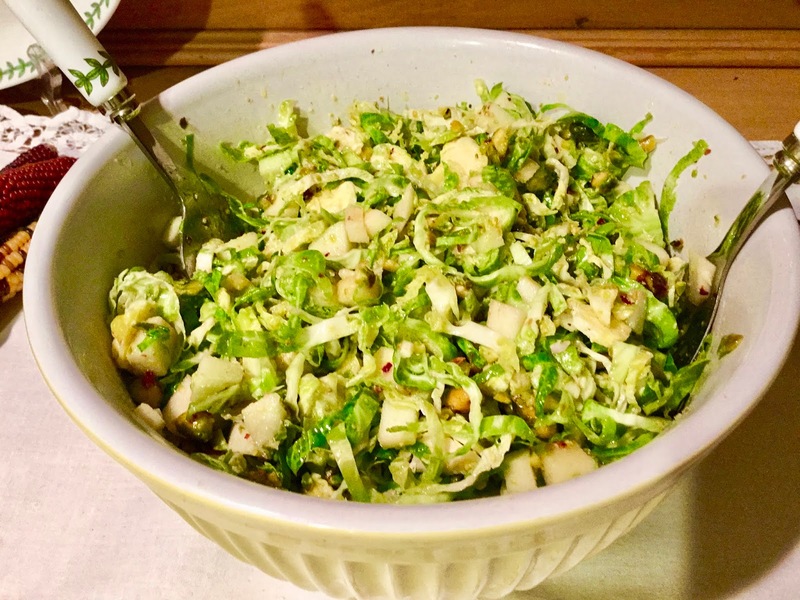 For a deliciously healthy autumn salad I love fresh raw Brussels Sprouts combined with apples, pistachios and shaved parmesan cheese- dressed with a light lemon vinaigrette. Combine Brussels Sprouts, apples, pistachios and cheese in a bowl. Toss with lemon vinaigrette. (If you prefer you can serve vinaigrette on the side.) I like my salad lightly dressed. Refrigerate remanding vinaigrette for up to two weeks. Lemon Vinaigrette: Combine all the ingredients in a bowl and whisk to combine. Beets taste so delicious that I sometimes forget their health and nutritious benefits. Beets are low in calories yet high in fiber, antioxidants and an array of important micronutrients. And fresh beets are so easy to cook, readily available year round, don’t use canned. 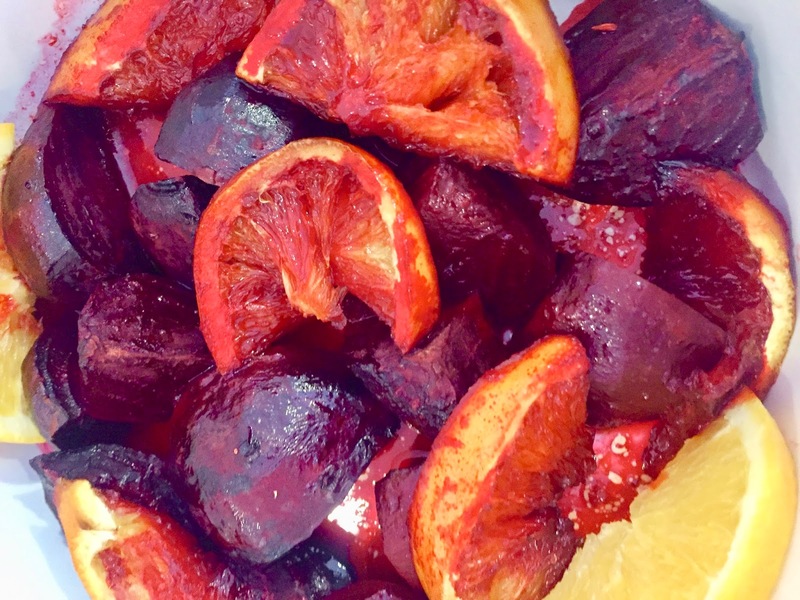 Beets roasted with citric juices enhances the root flavor of beets creating a nice glaze. A fine salt like Pink Himalayan is used to finish the dish adding a burst of flavor, not to salt while cooking. Gourmet salts from around the world are all the rage with so many different choices as well as added ingredients. On a recent trip to Amelia Island in Florida I had the pleasure of staying at the Ritz Carlton with the famous Salt restaurant and boutique with the boutique stocking salts from around the world. Assisted by a knowledgeable salesperson I returned home with a array of interesting salts. 3 oranges, 2 juice and one cut into half slices 1-inch thick. Place the cut beets in oven proof baking dish. Combine olive oil, thyme, lemon and orange juice pouring over beets. Roast for 50-60 minutes, turning once or twice with a spatula, until the beets are tender. Remove from the oven and immediately sprinkle with salt and serve warm. Eggplant a versatile vegetable who like a chameleon changes assuming the characteristic of the spices and ingredients used by the cook. Eggplant parmesan, beautiful stacked eggplant, tomato, mozzarella towers, baked stuffed eggplant and more I could continue adding to the variety of the eggplant recipes; all equally delicious. 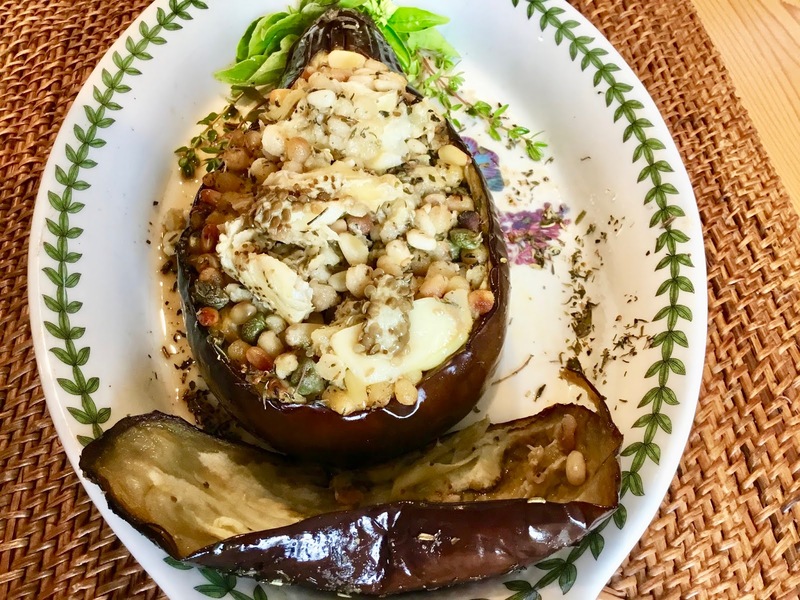 I was moved to create this recipe one day when I was at a farmer’s market and saw a beautiful array of eggplant glistening with fresh picked dew beaconing me to purchase. 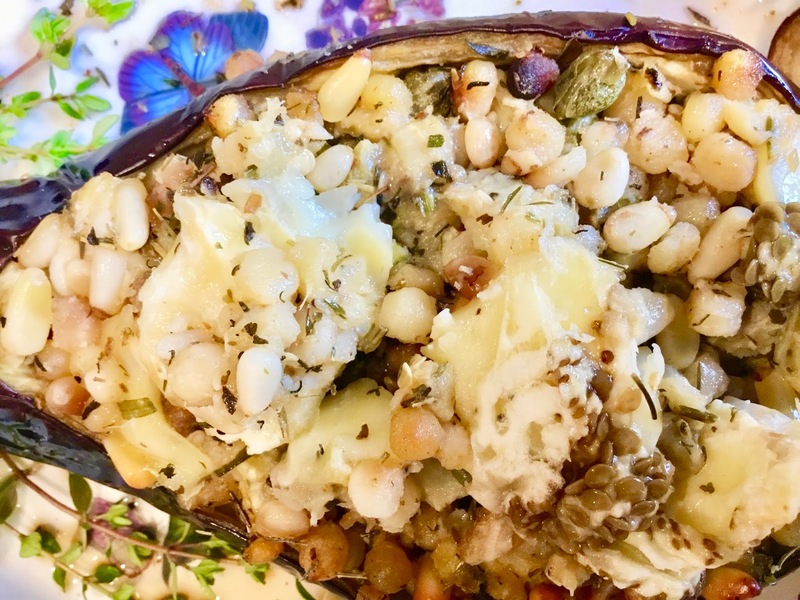 Once home I started thinking about how to cook the beautiful eggplant and I just decided to leave the eggplant whole hollowing out the center using the meat as stuffing and the shell as a baking dish. As a filler to substance to the ingredients I use La Casa de Grano Fregolo Sarda a traditional Sardinian Pasta that is toasted available at Italian markets such as Eataly or on line. 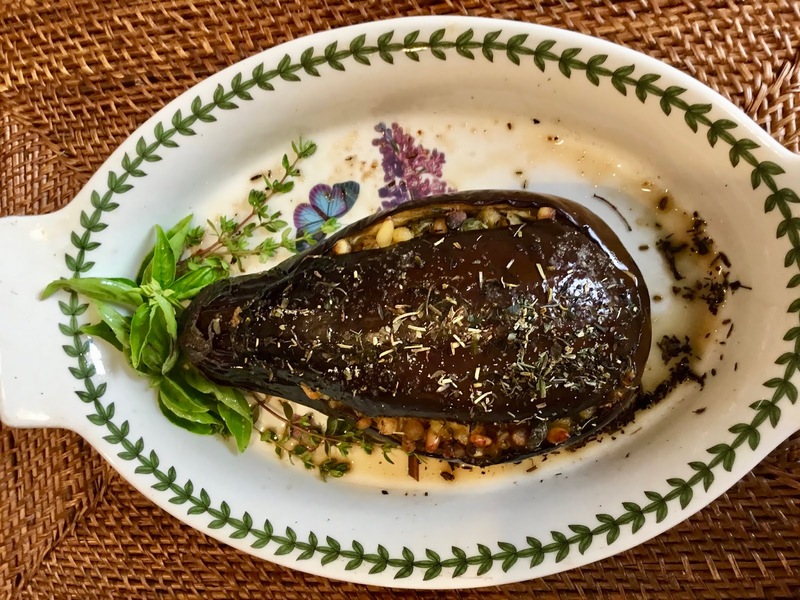 I loved the texture and resulting taste all the flavors marrying to create a delicious baked eggplant, a beautifully presentation too. Preheat oven to 400F. Gently remove top of eggplant and set aside. Cut out eggplant meat and cube. Place eggplant in bowl add lemon juice and sea salt. Put olive oil in saute pan and heat. Add garlic and saute until slightly translucent, don’t brown. Add cubed eggplant, basil, thyme cooking about 5 minutes until eggplant is soft. Continue cooking for another 5 minutes after adding pine nuts, pasta and capers. Put eggplant mixture into hollowed out eggplant layering with cubed brie. Place eggplant lid on top. Drizzle with olive oil seasoning with salt and pepper. Bake for 30-35 minutes or until the filling starts to escape from the eggplant. Serve at room temperature. I am not much of a kitchen gadget person; basic kitchen tools are my go to for cooking. So when my son purchased an air fryer which he said was perfect for achieving juicy food, crisp on the outside without frying or using oil and suggested I purchase one I did’t give it too much thought until he gave me a gift card for Williams Sonoma for Christmas to cover the purchase. After a little research I purchased the Philips Air Fryer with Tubo Star Avance from Williams Sonoma. At first I tried the basics, chicken wings, ribs, hot dogs and more. Then I turned to vegetables which I just find fabulous in the air fryer especially beets. 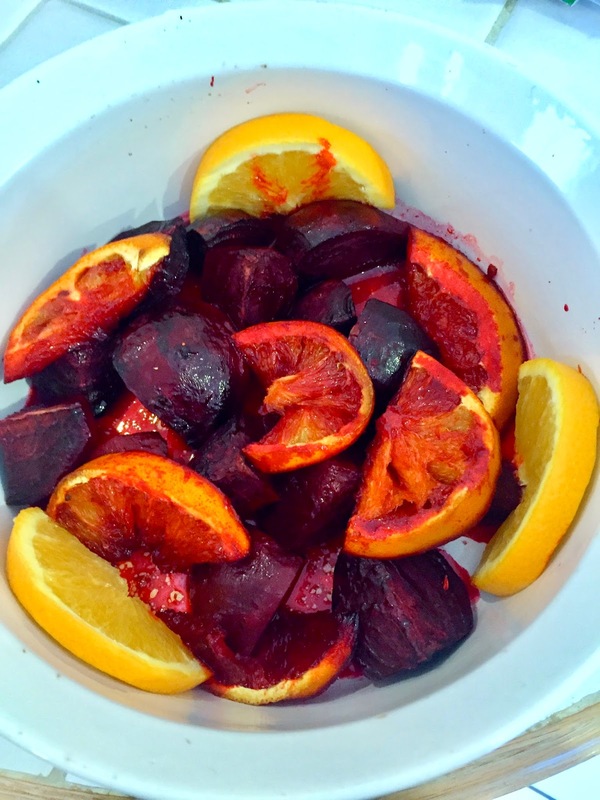 Fresh beets are so good for you and in my air fryer I found a no mess quick method of cooking. After cooking the beets I just store in the refrigerator to use on salads for added flavor and color. Sprinkle beets with sea salt and place in air fryer. ‘Fry’ at 400F for 25 minutes. The resulting beets are perfectly cook without losing flavor or nutritional value. I used the cooked beets in my recipe below! I was in the mood for egg salad one day but not an ordinary egg salad so I just started mixing some of my favorite ingredients. If I do say so this turned out delicious. 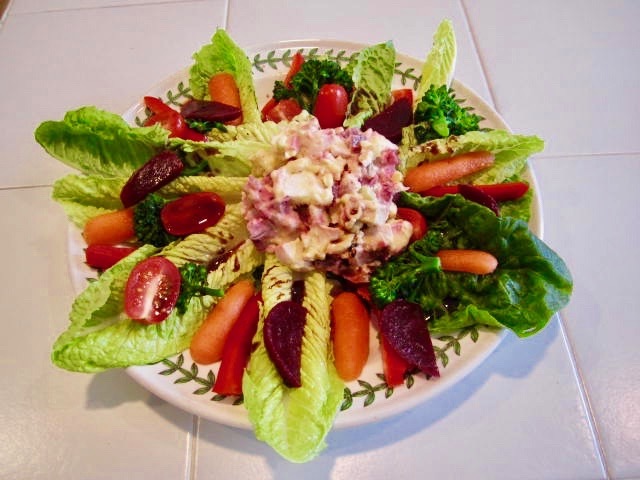 I will caution that this egg salad is very rich so just eat a smaller portion with a wonderful salad of fresh vegetables. My philosophy has always been that you can eat well staying thin and fit if you use portion control of rich foods. I like to balance my meals with more greens and fresh vegetables, less high caloric foods. If I make and eat a rich dish I watch my portion. Also exercise is essential for staying fit and healthy. Find a physical activity that you enjoy to incorporate into the fabric of your day then you will always have time for exercise! Back to food I do believe that presentation is so important even if you are eating alone, make it look good! I made a colorful salad placing a small amount of egg salad in the center, drizzled some balsamic vinegar for a beautiful and wonderfully tasting dish. Did I mention so easy too! My favorite method to prepare vegetables is roasting. I love the way the flavor is released in the roasting process. I adding garlic for extra flavor along with pine nuts for crunch making the green beans a special side dish. You can also use other veggies for this dish. Asparagus, broccoli and fingerling potatoes to name a few work well roasted with garlic and pine nuts. Cooking is all about being creative with mixing delicious combinations of spices and flavors to your own liking. Experiment is the best way to improve your cooing skills and confidence. Preheat oven 400F. 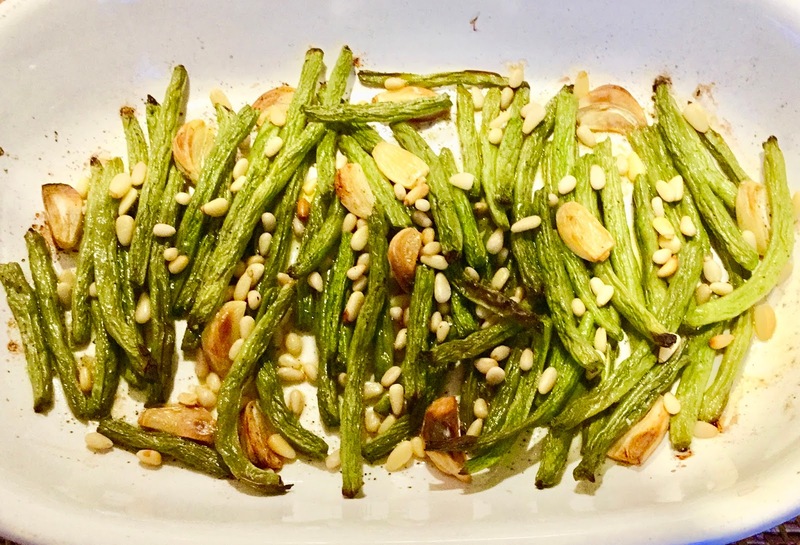 Toss green beans with olive oil, garlic, salt, and pepper. Place in baking dish. Top with pine nuts. Roast beans until slightly shriveled and have brown spots, 20 to 25 minutes. Serve at room temperature. 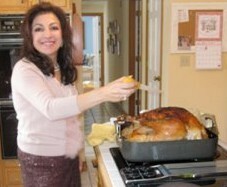 If you follow my blog you can see that I am very much into roasting vegetables which greatly increase flavor. 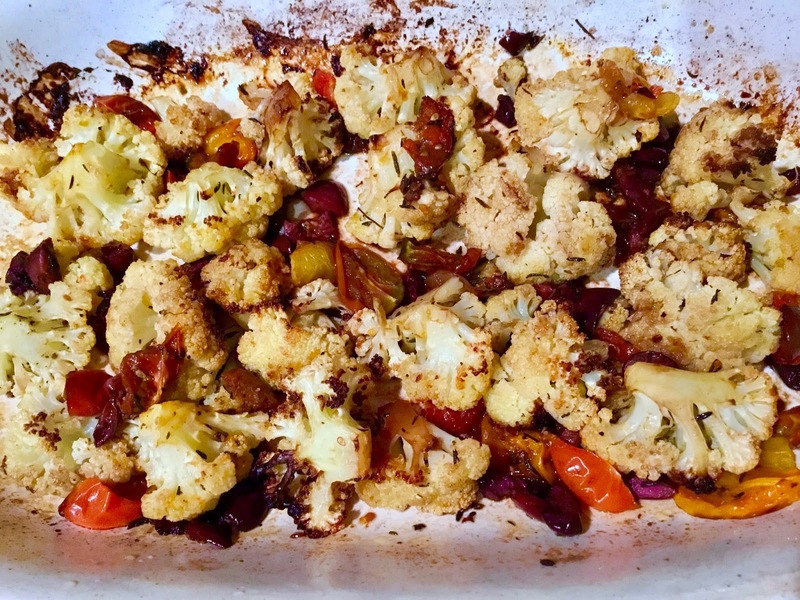 I love to roast Cauliflower combining olives and tomatoes seasoned with thyme then finishing with a splash of Fig Vinegar. If you haven’t tried Balsamic Fig Vinegar I highly recommend replacing regular balsamic vinegar with this outstanding flavorful variety. Sweet figs are blended with tart balsamic vinegar for a uniquely rich multilayered flavor adventure. I substitute balsamic fig vinegar in cooking as well as in fresh salad dressing. Tip: To prepare florets from a whole head of cauliflower, remove outer leaves. the center of the head. Break or cut florets into the desired size.